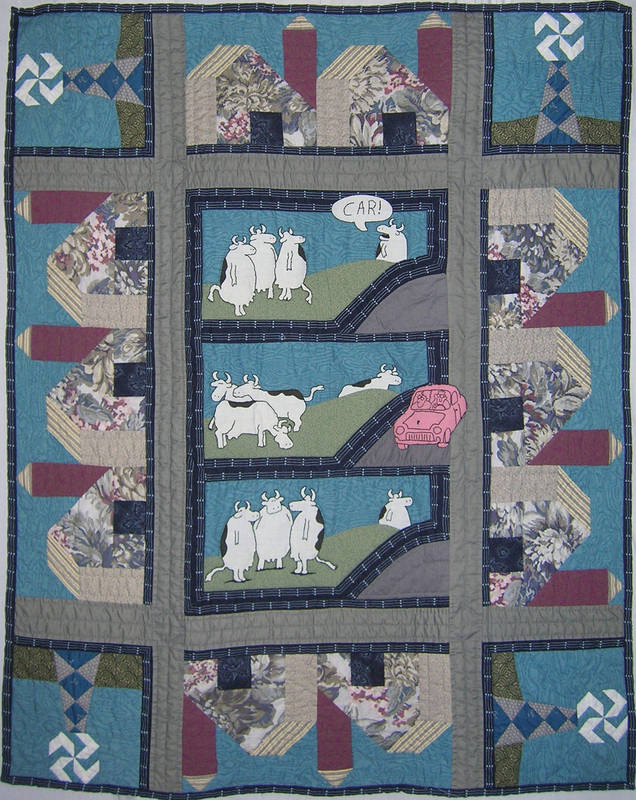 One in a series of quilts using my barn pattern. 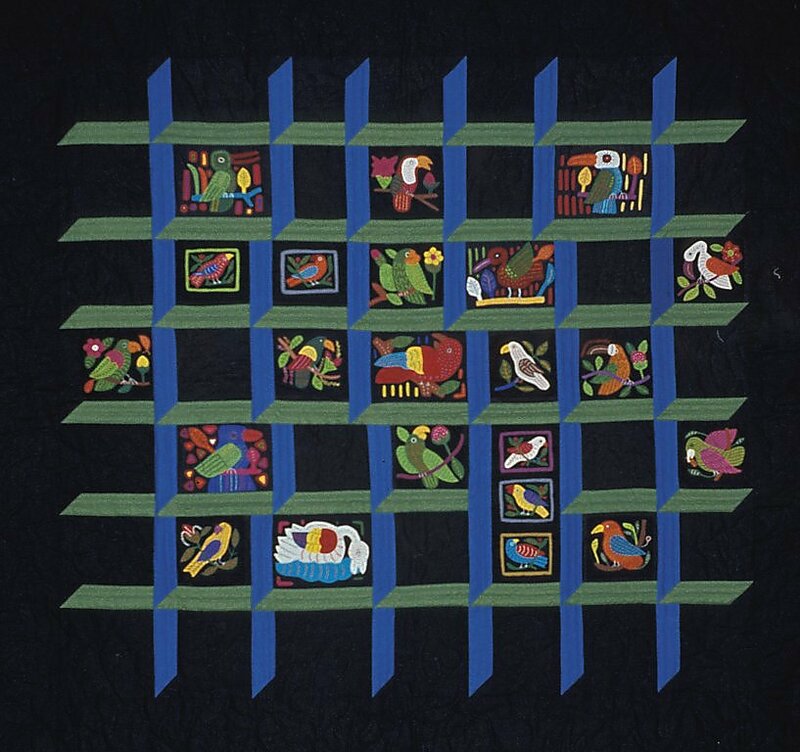 The bird molas came from the San Blas Islands off the coast of Panama. 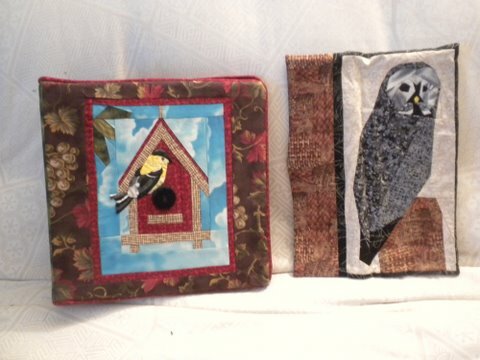 I set them in an attic window pattern and quilted one bee into the design. 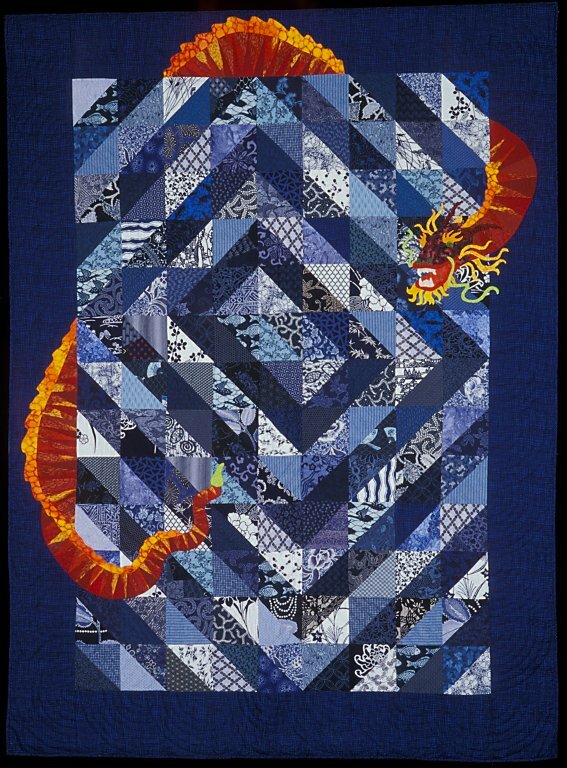 Unusual ways to set blocks together into a harmonious quilt top is one of my major quilting interests. 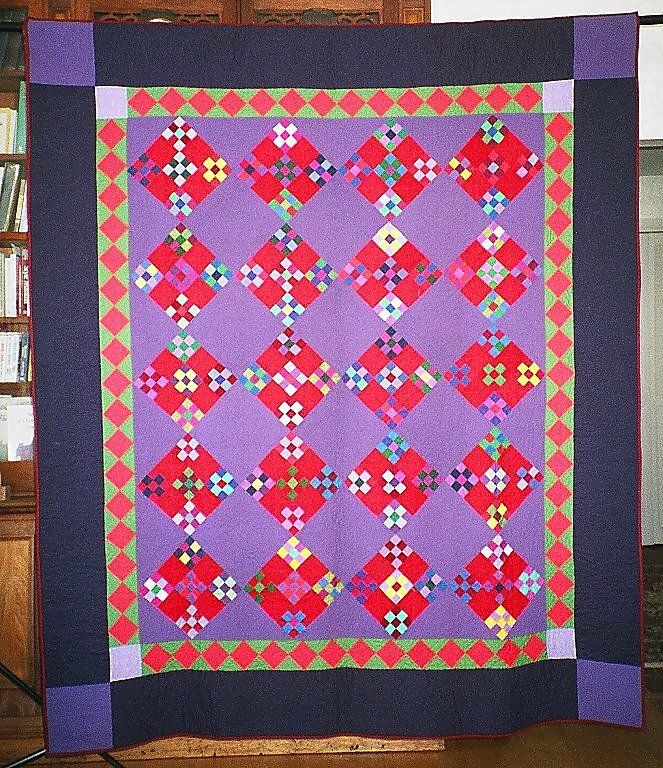 When my oldest granddaughter, Alison, was almost three and her family was living with me while their house was being build, she helped me select and arrange the colors for this schoolhouse quilt. It has been on the wall in her room ever since. 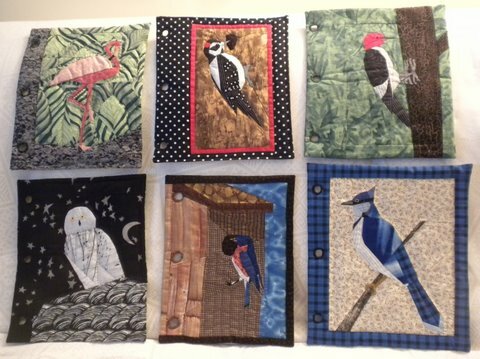 She has since made a few small quilts by herself. 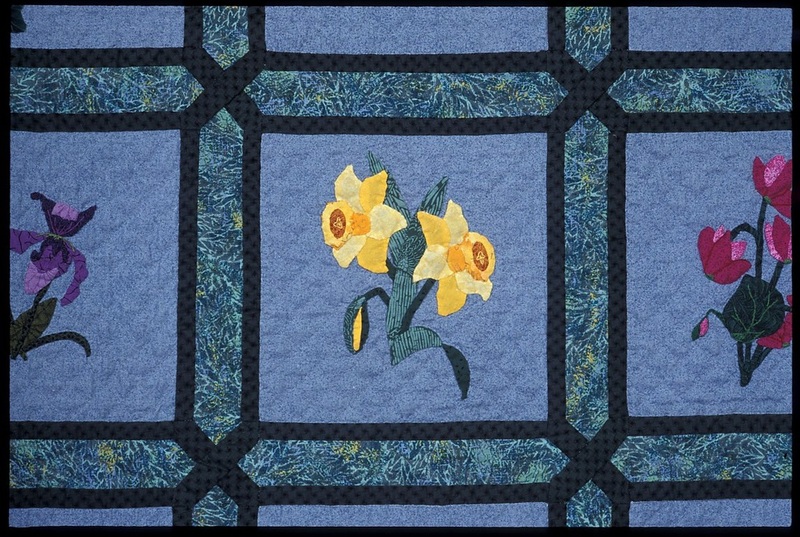 My friend, Pat Gallagher, designed the appliquéd flowers for a project with our Annandale quilt group. For some reason, my friends had the impression that I didn’t like appliqué. 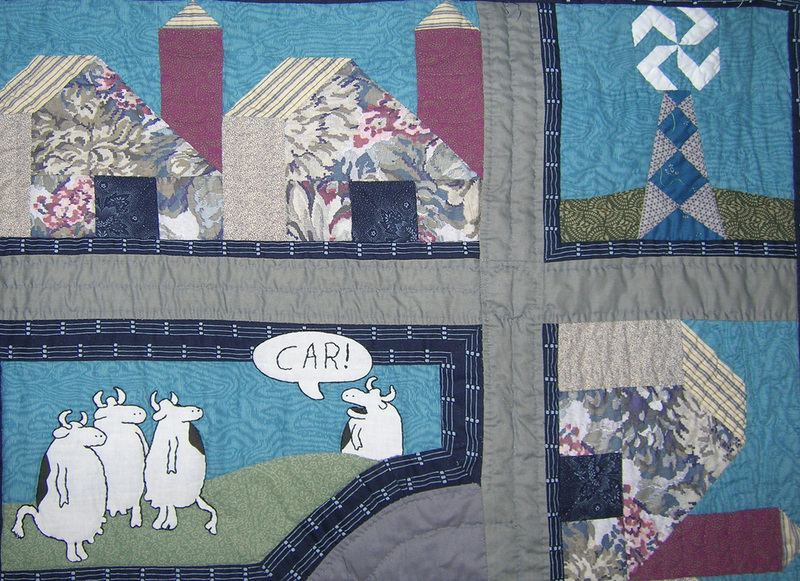 I made this quilt to dispel that notion. 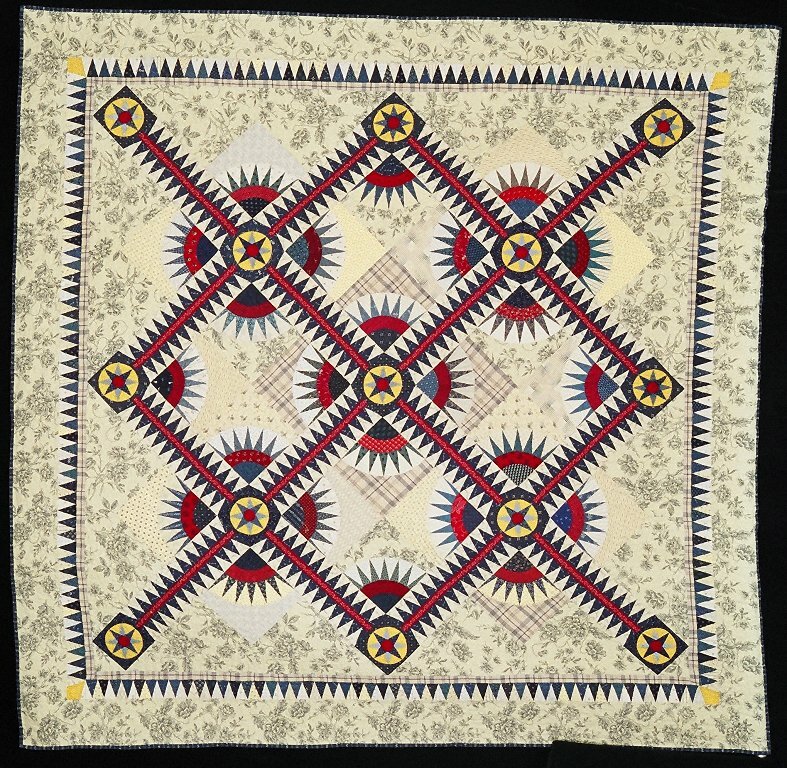 The hours I spent with Pat writing a pattern book were sheer pleasure. 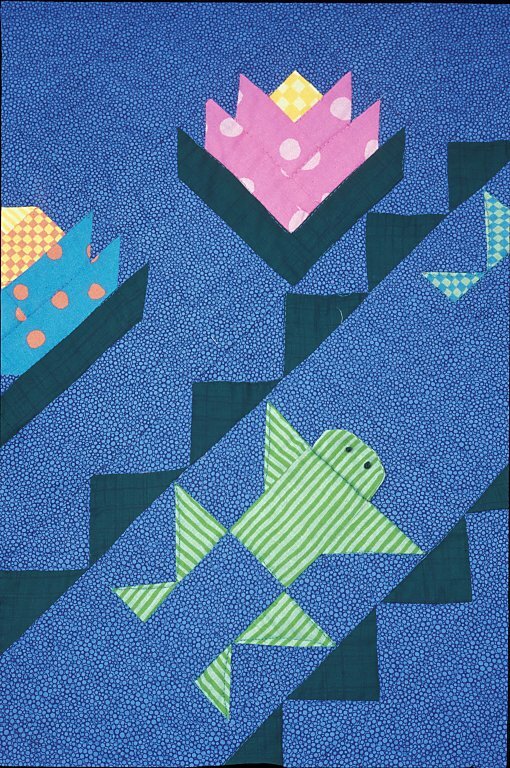 Making quilts for my newborn grandchildren has been such a joy. When they move into a big bed I make another one for them. 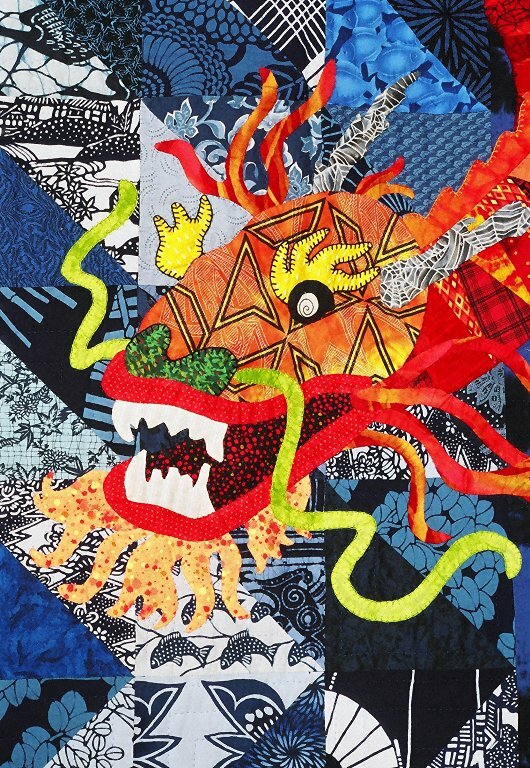 This is Emily’s quilt, which ended up on her wall. This hodge-podge of different units was a challenge to set together. 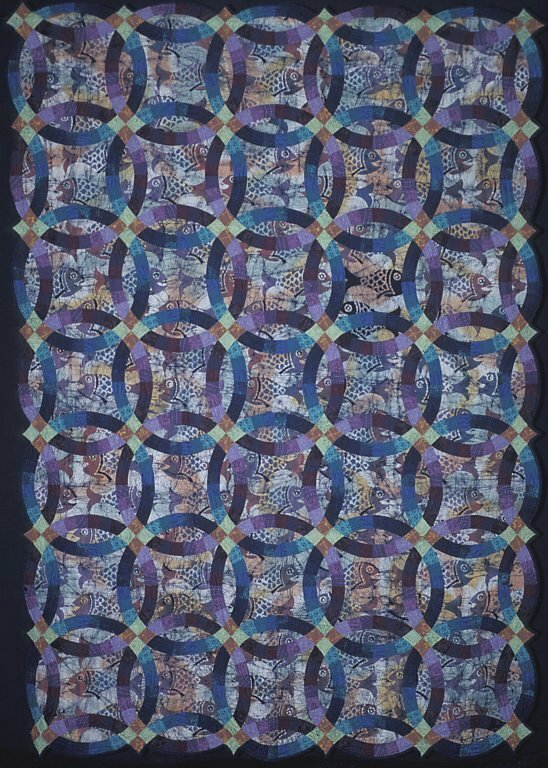 This is my first effort at machine quilting. Not too bad, but I don’t like doing it. 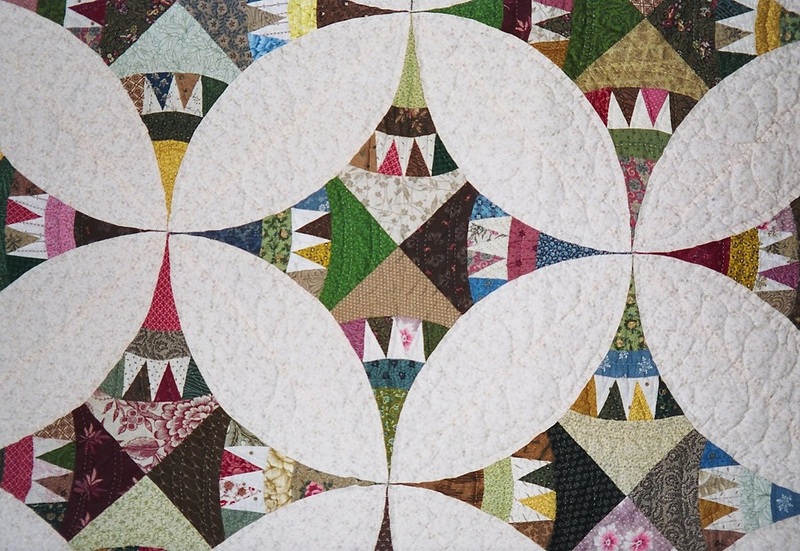 One day while visiting my friend, Kay Lettau, she commented about how many friends she had who had the templates for a double wedding ring quilt but had never used them. I was one of those people and on my way home I stopped at the fabric store and found this wonderful batik fabric that I used as my focus fabric. Fish are swimming behind the rings that remind me of an experience I had in Alaska when I observed humpback whales bubblenet fishing. They swim in a circle forming a net of bubbles that trap all the fish within. 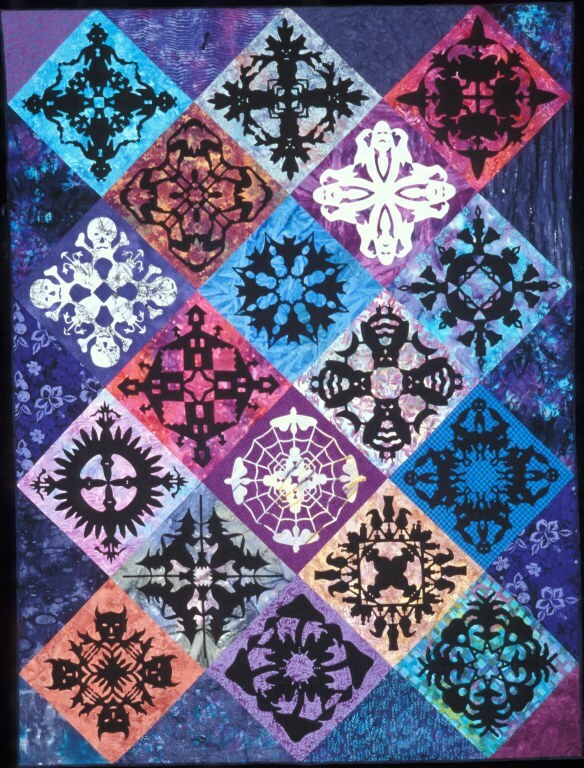 My friend, Pat Gallagher, saw this pattern in a magazine and really wanted me to make it which I eventually did. In fact, she bugged me about it for months. I sometimes call it "Pat Made Me Do It." 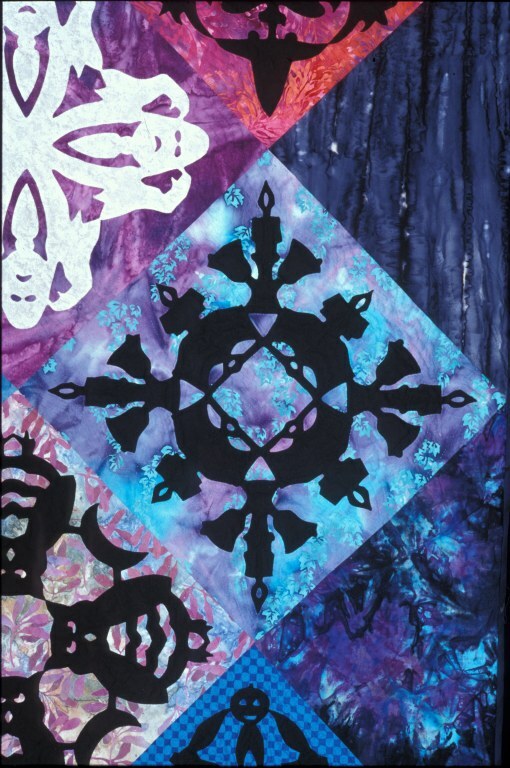 I converted part of the pattern into paper piecing. It is a nice reminder of her. 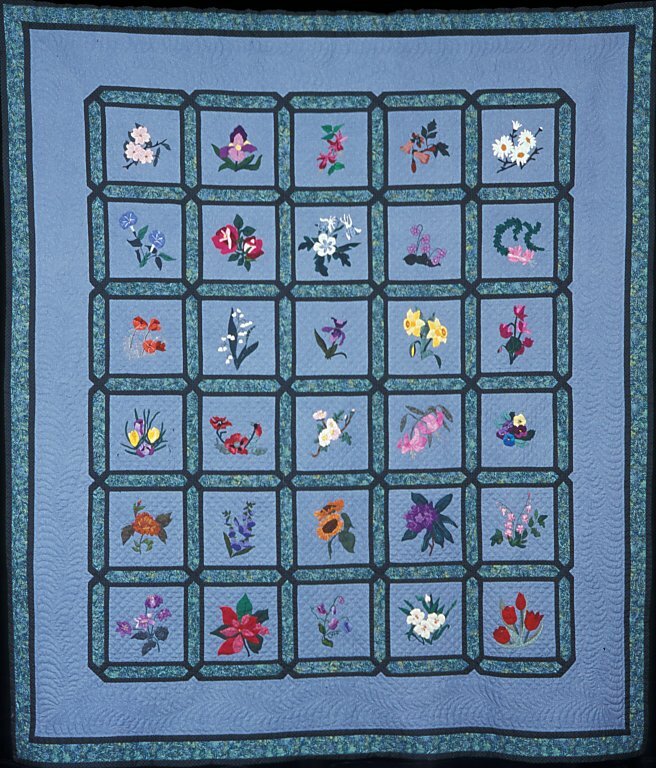 After a long-time friend, Lenore Parham, died of ovarian cancer, her husband, Wally, inspired her group of quilting friends to make small quilts depicting plants that either are being used in cancer treatment or are being assessed for biotechnology use. My plant represents Fagara macrophylla, and is one of 27 in the exhibit. The show has been on exhibit in cancer treatment centers since 1998 and is still actively scheduled on tour through at least 2004. 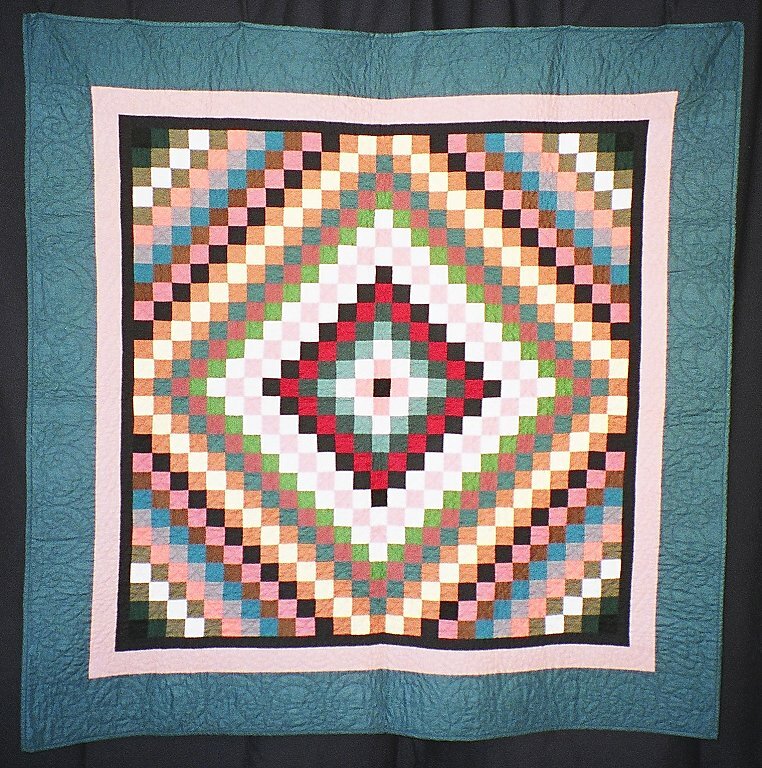 This quilt was an effort to stretch myself in the use of colors. 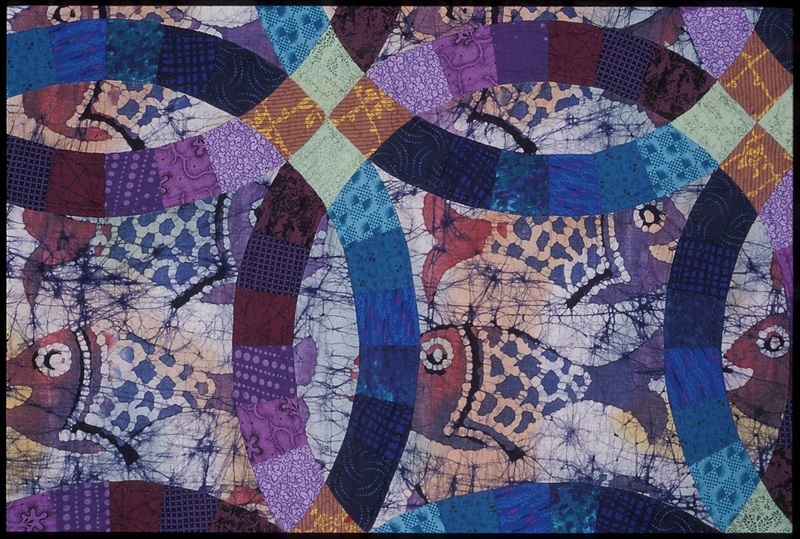 Early in my quilting career I found solids difficult to work with. By 1998 it had become much more fun. 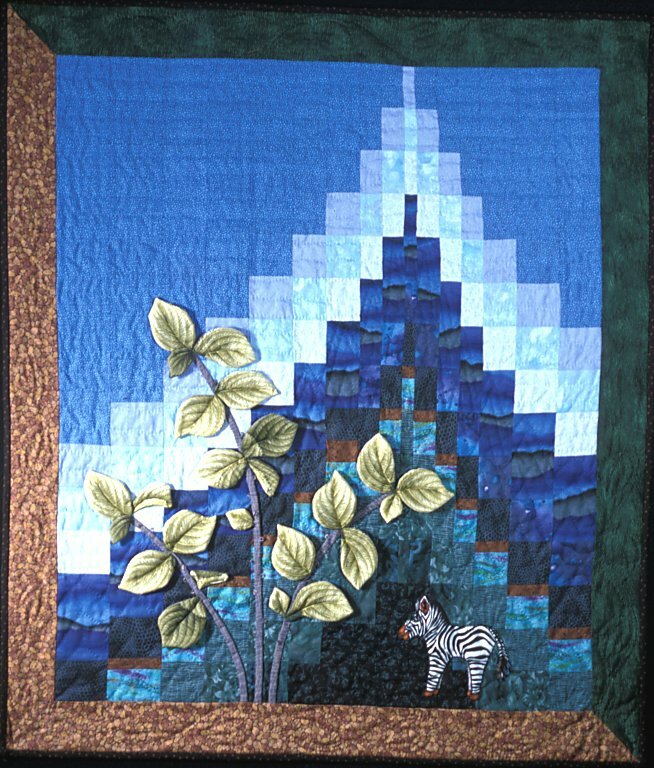 For a long time I wanted to make a Hawaiian style quilt but had trouble settling on a design. One night my friend, Pat, and I watched the movie, Bell, Book & Candle, and the inspiration hit. We spent hours cutting paper patterns and brainstorming ideas. The blocks all represent some piece of literature, a play, or a quote from someone well known. 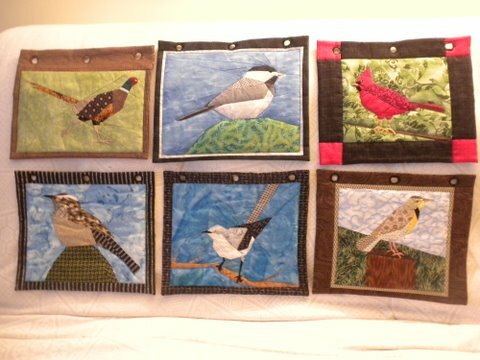 I wrote a pattern book which includes 18 appliqué patterns (plus a bonus one not pictured), instructions for the appliqué and suggestions for quilting. 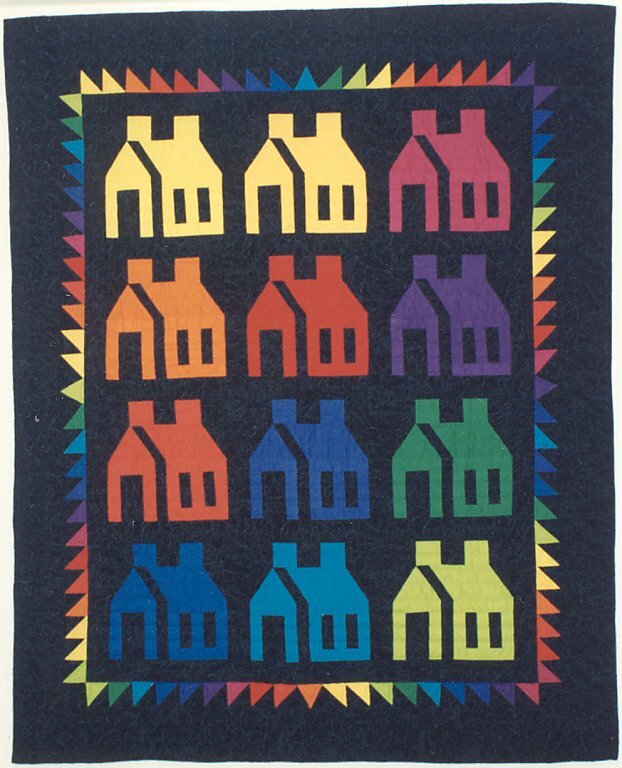 Of my quilts, this is my favorite. One year I drew my son, Andy’s, name in our family Christmas drawing. 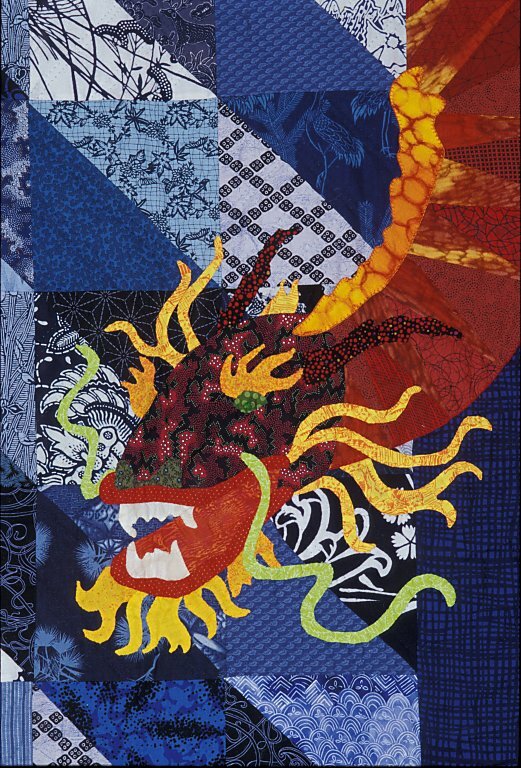 He hinted very strongly that he would love to have a quilt and “if it happened to have a dragon on it I would love it.” Puff’s Inner Child is the result of that project which I loved doing. I missed having ownership of that quilt so made a few changes and made one for myself. 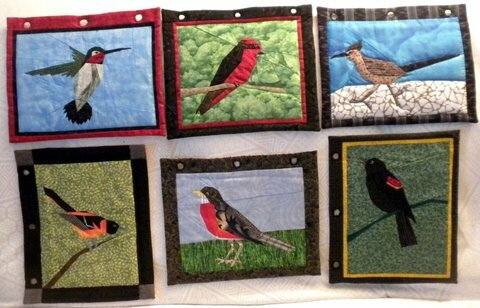 Brenda Groetz designed a series of foundation pieced bird patterns. Bird watching is an enjoyable hobby of mine. Displaying them as pages in a book worked well. 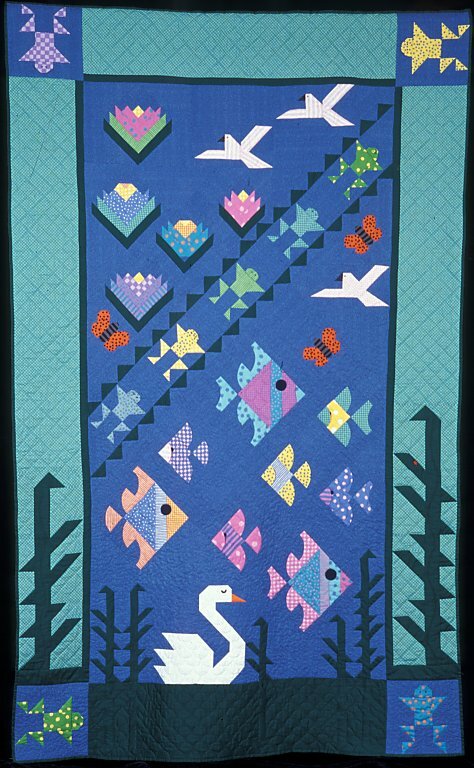 The appliquéd bird on the cover is by Carol Miller. 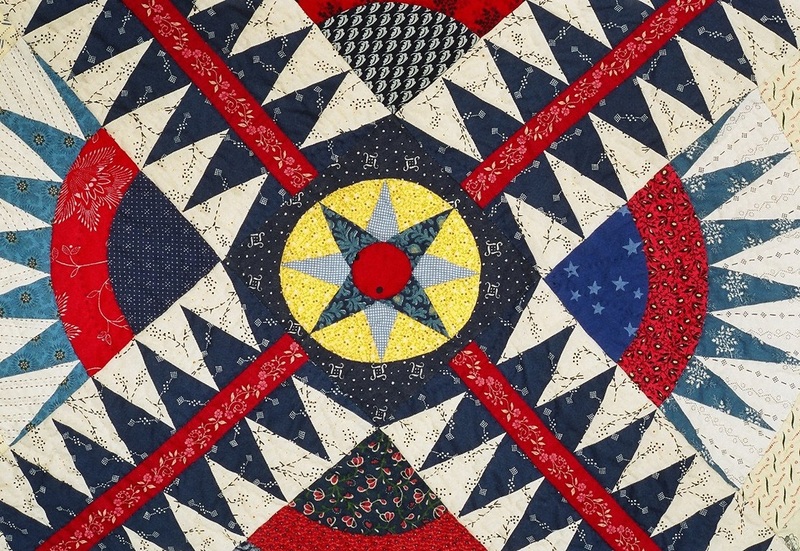 The 13 stars in this quilt represent the original 13 states. 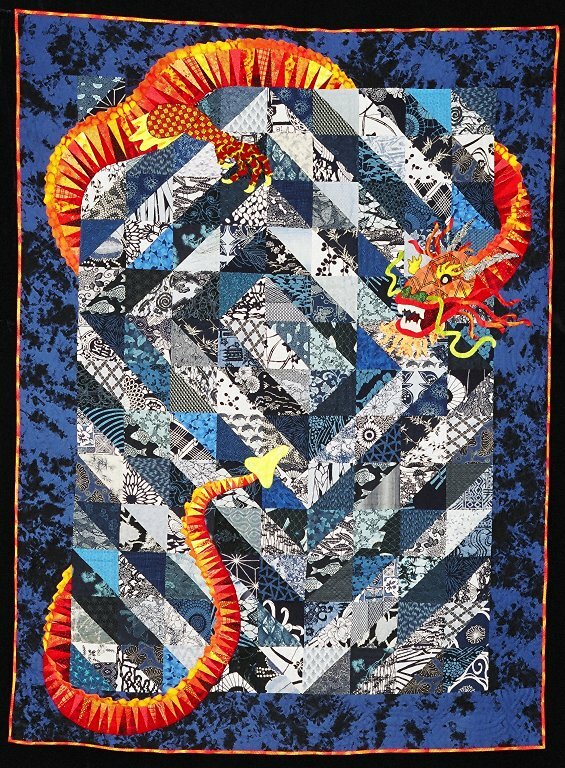 It was entirely machine pieced and hand quilted. I consider it my patriotic American quilt. 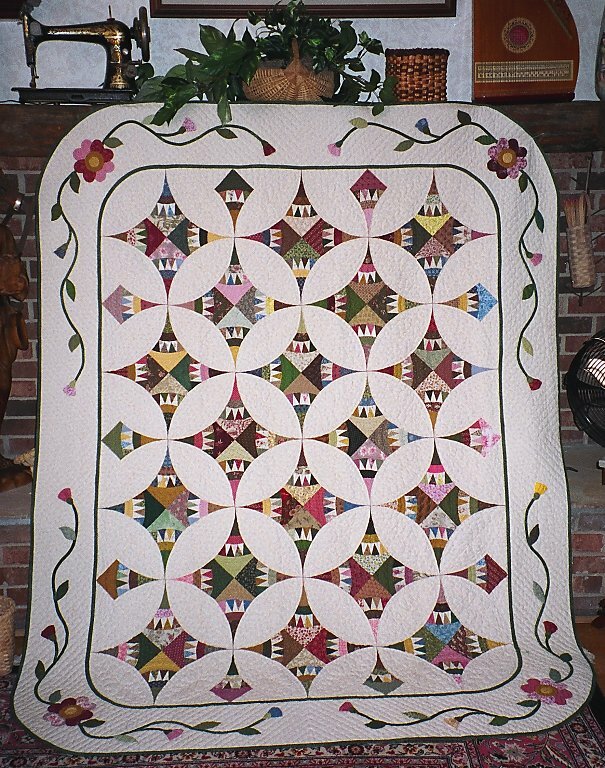 It is a version of the pattern, New York Beauty, and I was encouraged to make it by my friend, Kay Lettau.